Even a zombie deserves to look as beautiful as she feels on her wedding day! When she wears the Undying Love Veil, this blushing bride can walk down the aisle in graceful and gruesome style that will restart her undead lovers heart! 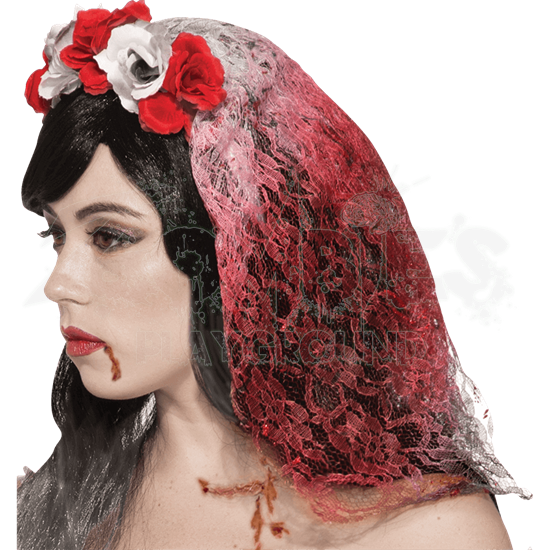 With rich reds and elegant whites, this zombie bride veil combines the traditional veil with ghastly style does not detract from an undead ensemble. This shoulder length veil is crafted from a soft polyester lace material, dyed red to resemble a blood-stained garment. Red and white faux roses line up on the top of the head for a floral crown feel. Wearing this costume veil is easy and comfortable thanks to the attached headband, making it perfect to wear for Halloween, zombie events, and much more! Til Death Do Us Part will not be enough to describe your love when you add the Undying Love Veil to your undead bridal ensemble! Dress, wig, and other accessories not included.